Discover Pennsylvania's Competitive Position In Today's Marketplace. PA state expenditures of state funds per capita ranked 18th in the nation in 2012 at $3.24. Rank improved 3 places from 2009. PA state General Fund expenditures per capita ranked 29th in the nation in 2012 at $2.12. Rank improved 3 places from 2009. PA high school graduation rates ranked 16th in the nation at 84% in 2012. Unfortunately rank declined 2 places from 2009. PA bachelor’s degree attainment ranked 24th in the nation in 2011 at 27 percent. Rank improved 2 places from 2009. PA advanced degree attainment ranked 17th in the nation in 2012 at 10.9 percent. Rank improved 1 place from 2009. PA produced 34.12 patents per capita in 2013, ranking 25th among all states. Only 12 percent of PA’s population was without health insurance in 2012, ranking 13th best among the 50 states. PA ranked 14th among the 50 states with 3.1 community hospital staffed beds per 1,000 population in 2011. In 2012, Pennsylvania had 302.1 doctors per 100,000 population ranking 8th among the 50 states and improving 1 place from 2009. PA ranks 11th among the 50 states in 2014 for health insurance exchange market competition. PA’s state sales tax rate of 6% ranks 25th among the states. The rank improved 2 places from 2009 because other states increased rates. PA’s Unemployment Comp tax rate improved 4 places in national rank from 2009 to 2014. But we’re ranked 41st. PA’s Workers’ Comp premium per $100 payroll national ranking declined 2 places from 2009 to 2012 to 39th place. PA’s Personal Income Tax rate – applying also to small businesses – was 8th best in the nation in 2015 at 3.07%. Property taxes as a percent of home value ranked 38th in the nation in 2012 at 1.49%. The Pennsylvania Scorecard provide policymakers and the public with an objective, statistically-derived assessment of Pennsylvania’s competitive climate for attracting, growing, and nurturing private-sector economic activity. The Pennsylvania Scorecard will provide an annual benchmark against other states and a historical record of public policy impacts on state competitiveness. The Pennsylvania Scorecard provides an accessible central location of relevant and timely metrics that are primary inputs to economic development. These data are influenced by state public policy and provide a collective assessment of decisions and actions that impact competitiveness. The data were chosen based on the consistency and transparency of the methodology used in their collection, the trustworthiness of the source, and the absence of indices and weighting. The data display Pennsylvania’s absolute and relative position consistently over time. 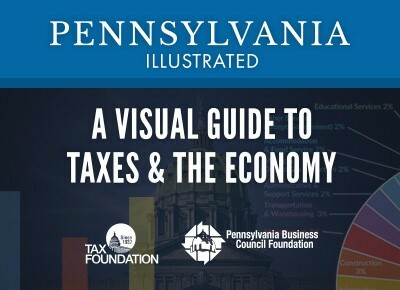 Report on PA Taxes Just Released.